Combined U.S. sales of the Escalade SUV, short and long wheelbase models, jumped more than twofold last month to 3,237. DETROIT -- General Motors' April sales rose 5.9 percent, as booming crossover demand offset continued weakness in GM's car lines. GM's retail sales rose 5.3 percent while deliveries to fleet customers climbed 7.6 percent, for a total of 269,056 units. GM said its commercial sales, or deliveries to business customers, were the highest since March 2008. Crossover sales surged 25 percent, driven by big jumps for the Chevrolet Equinox (up 42 percent, to 28,856 units) and the Cadillac SRX (up 41 percent, to 6,390). GM said its crossover deliveries, which include the new Chevrolet City Express van, totaled 78,354 in April and were its highest ever in a single month. Truck sales -- which include pickups, SUVs and fullsize vans -- remained strong amid low gasoline prices, up 13 percent. The Chevy Silverado and GMC Sierra full-size pickups rose a combined 7 percent. Combined sales of the Chevy Colorado and GMC Canyon totaled 9,442, the highest tally since the midsize pickups were launched last fall. Car sales fell 12 percent, though the drop was not as steep as the 21 percent declines GM saw in both March and February. GM said its average transaction price was $34,750, up $880 from a year earlier, citing data from J.D. Power. The average transaction price was up $1,580 through the first four months vs. the same period a year earlier. Incentive spending in April was equal to 9.5 percent of average transaction prices, which was in line with March and down 0.6 percentage point from last April, GM said, citing J.D. Power. The industry average was 9.2 percent, GM said. GMC has been the biggest winner from the market shift toward trucks and crossovers sales, with sales up 20 percent in April and 16 percent for the year. GMC accounted for about half of GM's sales growth during the first four months, despite representing just 18 percent of the company's overall deliveries. Buick, on the other hand, has been hurt by the shift away from cars, with volume down 5.2 percent in April and off 4.7 percent for the year. The Encore small crossover was the lone nameplate to post a sales gain (up 29 percent) while Buick's three car lines -- the LaCrosse, Regal and Verano sedans -- all posted double-digit declines. Deliveries at Chevrolet, which accounted for 70 percent of GM's volume last month, rose 3.4 percent, driven by a 51 percent jump in crossover sales. Equinox sales benefited from the removal last year of the Captiva Sport, which had been a fleet-specific entry. Chevy sold 3,451 units of the Trax small crossover, which debuted late last year. 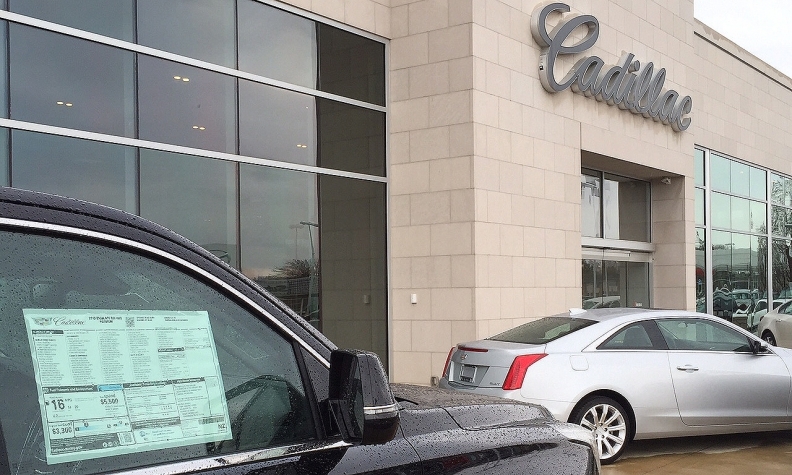 Cadillac sales rose 14 percent, the brand's first double-digit sales gain in 18 months. Escalade SUV sales jumped more than twofold, to 3,237 in combined short and long wheelbase models. But the brand's volume sedans continue to struggle: ATS sales sank 23 percent while CTS sales fell 47 percent.